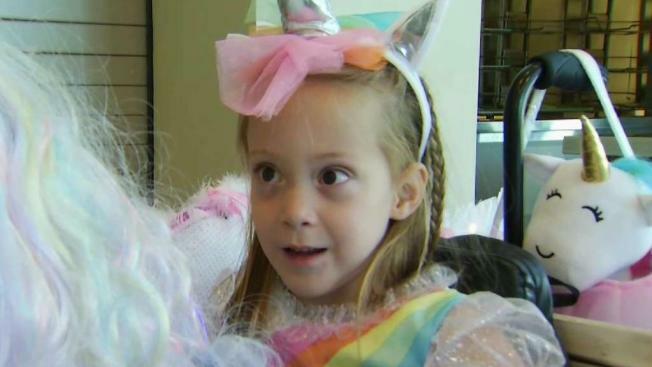 A Los Altos 5-year-old got the costume of her dreams thanks to non-profit Magic Wheelchair. Eliza uses a wheelchair and really wanted to be a unicorn. On Tuesday, she became one. A Los Altos 5-year-old got the costume of her dreams thanks to non-profit Magic Wheelchair which dedicates itself to building custom costumes for children in wheelchairs. Eliza really wanted to be a unicorn and on Tuesday, she became one. Three employees from Varian Medical Systems in Palo Alto spent two months making the costume to fit her chair after they were connected through the non-profit. "For her to have something that's just for her, just made for her, uniquely hers is pretty amazing," said mom Cori Poffenberger. Eliza said she can’t wait to show her classmates Wednesday at school. The volunteers say they plan to make more Magic Wheelchairs for other Bay Area kids in the future.